I read this right around my 40th birthday, less than a week after saying something similar to a new doctor. She took in my words, turned to look at me, and gave me this title. It shook me, and reordered a dozen things in my life that had never quite made sense. 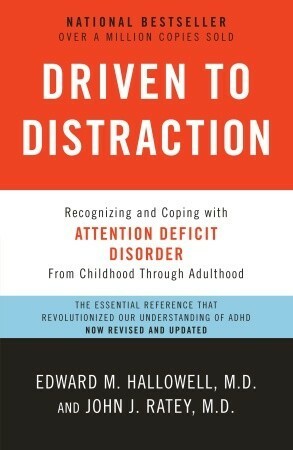 I'm not sure I can give a clear review of Driven To Distraction, even now, months later. It was too deeply personal, spoke too directly to the fault lines I've struggled with in my life. What I can share is this bit of wisdom I found tucked away in the pages of the book - that an AD(H)D diagnosis is not always straightforward and obvious. It can masquerade as other cognitive differences, or be masked by them, so that the typical treatments are either ineffective or only seem to scratch the surface, leaving a residual fog that never quite clears. It doesn't always present as distractability or a lack of attention. It doesn't automatically translate to poor grades or a lack of traditional success. It's a variation in how our brains process information. It can be intuitive leaps that draw together disparate ideas. It can be bursts of spontaneity followed by a retreat to structure. It can be a sense of floating through life, not really sure how you got to where you are, but fairly well convinced that it can't possibly last - a feeling of always waiting for the other shoe to drop. It's often all of those things. If you have questions, ask. If you're curious, or feel like you might fit the profile, get evaluated. Read (or listen) to whatever you can find about it. I keep hearing that education is the biggest piece of AD(H)D treatment, even when medication is used. So go for it. Ask your questions.